Setting up a new PC? Wanting to add some desktop applications and have them update easily? 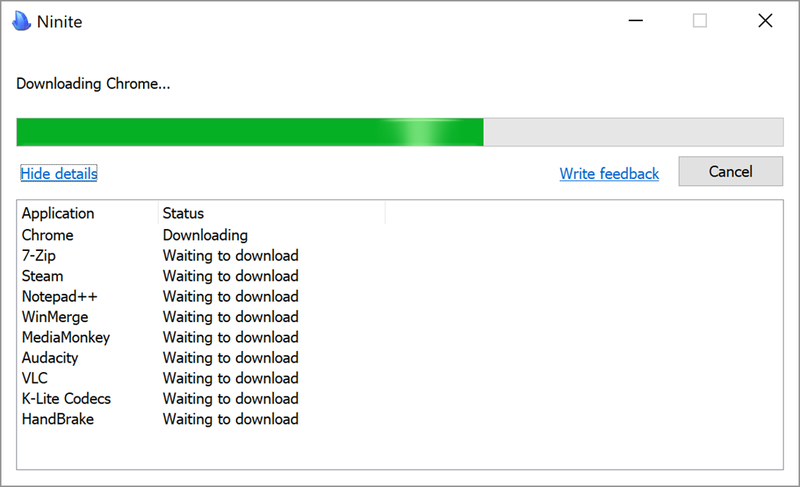 I’ve been using Ninite for years to download and install a set of core applications when setting up a new Windows installation. Ninite is a free service (although there are paid for options for business) that allows you to specify a list of popular applications from the homepage at https://ninite.com/, from here it will create a custom installer which you download to your PC. When you run the downloaded Ninite installer it will in turn download and install the individual applications to your PC in the background(deselecting any nagware or dodgy extensions). When the install is finished your chosen apps are ready to go. Better still, for the apps that don’t auto-update you can just run the installer again at some point in the future and it will take care of downloading and installing any updates. I’ve never had a problem with this application and I’ve been using it for a few years now, my only issue is remembering to re-run the installer to catch any updates as there is no prompt (so remember to keep the original Ninite installation program to hand! ).